Recently, there have been a few blog posts discussing evidence found on a system when USB devices are connected and removed (Yogesh Khatri’s blog series and Nicole Ibrahim’s blog). I’ve been meaning to release this post for a while and Yogesh and Nicole’s posts have motivated me to do so. Much of the conversation regarding USB device activity on a Windows system often surrounds the registry, but the Windows 7 Event Log can provide a wealth of information in addition to the registry. Utilizing the Event Log during USB device investigations has been mentioned in various other locations, including chapter 5 of Harlan Carvey’s Windows Forensics Analysis 3/E (and recently in Yogesh Khatri’s blog). This post discusses both USB device connection and disconnection artifacts found in the Windows 7 Event Log, specifically the Microsoft-Windows-DriverFrameworks-UserMode/Operational log, and explores an interesting value that can be used to pair a device’s connection event with its associated disconnection event. When a USB removable storage device is connected to a Windows 7 system, a number of event records should be generated in the Microsoft-Windows-DriverFrameworks-UserMode/Operational event log. The records include those with Event ID 2003, 2004, 2005, 2010, 2100, 2105, and more. Some of the generated event records contain identifying information about the USB device that was connected. For example, when viewing an event record with Event ID 2003 using the Windows Event Viewer, the event information below is displayed. A portion of the text formatting in the screenshot above above should look familiar to most, as it contains some of the same information about a USB device that can be found in the SYSTEM hive. Importantly, the device serial number (“000ECC0100087054”) is stored in last portion of the event record’s strings section. Combined with the record’s TimeGenerated field, an examiner can derive the date and time that a USB device was connected to the machine. When a USB thumb drive is disconnected from a Windows 7 system, a few event records should be generated in the same event log as the connection events. Records with Event ID 2100, 2102, and potentially more may be generated when a USB device is disconnected. Variables such as whether there is another USB removable storage device still connected to the system at the time a USB device is disconnected can dictate which event records are generated and which are not. Some records, however, appear to be more consistent. For example, it appears that an event record with Event ID 2100 and the text “Received a Pnp or Power operation (27, 23) for device <deviceInfo>” is consistently generated when a USB removable storage device is disconnected from a system. In addition, the same event record should contain the device’s serial number/Windows unique identifier that can be mapped to a device. An example of some of the information available from a disconnection event record with Event ID 2100 can be seen in the screenshot below. The LifetimeID value associated with a USB device’s connection session is an interesting piece of information. This GUID value is assigned to a UMDF (User Mode Driver Framework) host when a USB device is connected and should remain the same throughout the connection “lifetime” of the device. In other words, an examiner should be able to match the LifetimeID written to a device’s connection event records with the LifetimeID written to the device’s disconnection event records in order to tie a particular disconnection event with its associated connection event. This is simple enough when a single USB device is used, however, when multiple USB devices are used at once, they appear to all use the same UMDF host and are all assigned the same LifetimeID. This means that a LifetimeID value cannot be tied to a single USB device, but it appears that it can be used to correlate device connections and disconnections on a per-session basis. Utilizing the LifetimeID associated with a device connection session can help in developing a timeline that, among other things, indicates the length of time a particular device was connected to the system. In addition, the LifetimeID is useful in pairing a device’s connection event with its corresponding disconnection event. Since there may not be the same number of connection and disconnection events (e.g. a device is removed after the system has been powered down so no disconnection events are generated), the LifetimeID can help to make sense of various connections and disconnections and correctly pair the two together for a particular device. In addition to being used to determine the length of a USB device’s connection session via the Windows Event Log, the LifetimeID value may play an interesting and useful role in determining the time a USB device was last disconnected from the system, based on the LastWrite time of a registry subkey. I’ll forego this discussion for now since this post is focused on event records, but will revisit this topic later. Automating the process of identifying connection and disconnection event records can really allow the power of utilizing the Windows Event Log in USB analysis to shine. While entirely possible, it would be a tedious process to manually analyze the Windows Event Log for USB connection/disconnection events. 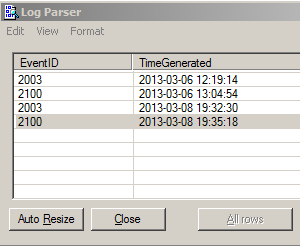 Microsoft Log Parser is a great tool for processing the Event Log in this manner. Given that event records associated with a device’s connection and disconnection will contain identifying information as well as a timestamp, it’s just a matter of isolating the event records associated with connection and disconnection and parsing portions of the strings section of the record. For example, the Log Parser query below returns all event records with Event ID 2003 (connect) or 2100 (disconnect) as long as the device serial number/Windows unique identifier (“1372995DDDCB6185180CDB&0” in this case) is contained in the Strings portion of the event record and, in the case of a disconnection event, the text “27|23” is also in the Strings portion. If you want to clean up the output and add a bit more information, you can use the Log Parser query below (replacing “1372995DDDCB6185180CDB&0” with the USB serial number/Windows unique identifier you’re interested in). As you can see, Log Parser dramatically reduces the leg work involved in analyzing event records for USB connection and disconnection events. Moreover, Log Parser queries can easily be incorporated into a batch script that allows the examiner to input the device serial number he or she is interested in to quickly identify the connection and disconnection events associated with the device. The LifetimeID value can then be used match associated connection and disconnection events. As with other event logs, event records in the Microsoft-Windows-DriverFrameworks-UserMode/Operational event log eventually roll over, leaving the examiner with a limit on how far back in time he or she can go. However, utilizing VSCs can allow an examiner to squeeze a bit more out of this approach and ultimately build a very telling history of USB device connection and disconnection events. Extract the kernel logs from the file system. Search the kernel logs for “USBMSC Identifier”. Extract all entries containing “USBMSC Identifier”. Format the entries to make them easier to read/sort (e.g. Excel format). Search the USB ID public repository for the vendor and product ID associated with each device. Update each extracted log entry for which the associated vendor and product ID was found within the USB ID public repository. Correlating the vendor and product IDs with the USB ID public repository can help to associate a name with the type of device that was connected (e.g. Amazon Kindle, PNY flash drive, etc.). This process can quickly become tiresome though, especially if there are many log entries for which you must search the USB ID repository. An examiner performing the same small task over and over again is a good argument for automating that task. With that in mind, I decided to write a script that would do as much of this for me as possible. Perl seemed to be a good option to use since it’s cross-platform and great with parsing. And after a bit of coding, testing, and tweaking, I now have a script that takes care of steps 2-6 listed above in a matter of seconds.The script is capable of parsing either a single kernel log or a directory full of kernel logs, outputting the “USBMSC” log entries in csv format. After using a regular expression to locate the “USBMSC” log entries, the script queries the USB ID public repository and attempts to correlate the vendor and product ID of each entry parsed from the kernel log(s) with a particular device listed in the repository. The script defaults to checking the online version of the repository, but if you don’t have a network connection or want to be able to run the script without querying the online database, you can optionally pass in the path to a local copy of the online database using the “-u” parameter (the text of the file must be in the same format as the online repository). When you’re importing the script’s csv file into Excel (or your choice of spreadsheet application), you’ll want to be sure and set the formatting of the USBMSC ID, Vendor ID, Product ID, and Device Release columns to text values in order to avoid the application interpreting the values as numbers and removing leading zeroes, etc..
I’ve only been able to test this script on kernel logs, but it should also work on the system logs from Mountain Lion as the relevant entries appear to be in the same format. As always, feedback, suggestions, and bug reports are welcome and appreciated.